Model Railways of Lima Spa (Lavoarazione Italiana Metalli e Affini) in Italy are less common in the German hobby press and almost nonexistant in the internet. As a Lima collector I wished to have a source for information. Especially the very early models are nearly unknown. This is the main reason for making this website. Shortly after WWII in 1946 Lima was founded as a supplier for aluminium castings for the Italian State Railways FS. In 1948, after FS-Italia was able to make their own aluminium parts, Lima started production of aluminium toys (boats, doll accessories, model cars). In 1954 Ottorino Bisazza bought Lima and began to make affordable plastic model trains. Naturally these trains vere very simple and not really prototypical. By the end of the 50´s Lima cought up with the big european manufacturers. Lima models were a good and cheap alternative to other models. In those early years Lima produced only Italian prototype models (D342, E424). From 1962 the Lima range got more international, French, Belgian, Netherlands and German models were catalogued. Some big German mail order firms decided to drop model railways from German manufacturers Bub, Dressler and Distler and replace them by Lima. This was one of the reasons that these brands disappeared. Ten years later Lima was one of the biggest model train makers in the world. USA, Australia and even South Africa recieved their own outlines. The success of Japanese and British H0 models was rather small. In 1977 Lima changed the whole British outline to the more common scale H0/00 (1/76) and became one of the leading train makers on the British Isles. The production capacity of the modern factory in Isola Vicentina reached 10.000 Locomotives and 30.000 Wagons daily in 1978 (Source: Ferrovie Italmodel, issue 218, August 1978). In continental Europe Lima switched their production to higher quality models from 1982, in 1989 Lima-Nova was introduced with short couplings, scale length coaches, cardanic drives, etc. Aditionally, Lima still listed a big hobby and starter set range, which contained many of the older models. In the second half of the 90´s Lima took over the production of Rivarossi, Jouef and Arnold, which remained under their former names.Eventually, the name Jouef was dropped. 2004 Lima stopped production and went into liquidation. 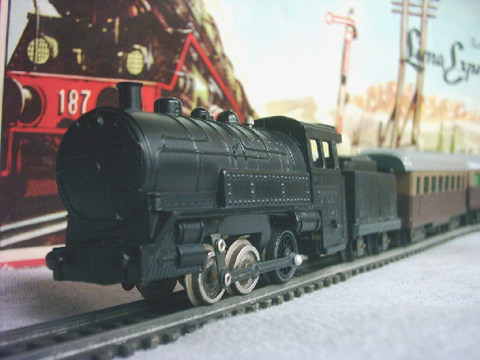 The moulds and names were then bought by the British manufacturer Hornby, who started producing Lima models again from beginning of 2006 in China. This was just a brief look into the Lima-History. This website only shows my own private collection of Lima models. For the English translation I generally chose "British Terms", with the exception of US-models. This site is not a sales site, please don´t bother me with enquiries! Something else, Lima also produced in N and 0-scales. I currently do not own any of these models, so they are not shown here!